Alan Marcus Band playing the hard drivin’ blues music of Stevie Ray Vaughan, Eric Clapton, Muddy Waters, B.B. King, John Mayall, Johnny Winter & many other great artists. 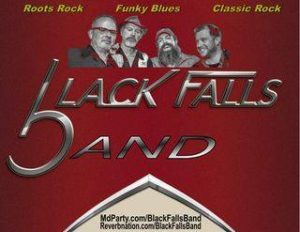 Black Falls plays an eclectic blend of rockin' blues with enough diversity to engage young and old alike. Killer slide guitars, acoustic, harmonica, tight rhythm section and pro voices to match.